I recently made these chocolate covered strawberries for a friend’s bridal shower. I received a lot of positive feedback and recipe requests. There was some disbelief when I claimed that these were really easy to make, but I’m here to show you just how simple it can be. 1. Heat an inch of water on medium until it starts to boil, then turn off heat. Place bowl of milk chocolate on top of pot, making sure the bottom of the bowl doesn’t touch the water. 2. Stir chocolate, until it’s all melty and smooth. Remove pot from heat. 3. Line a cookie sheet with wax or parchment paper. You’re now ready for dipping. The setup should be melty chocolate, strawberries, and parchment. 4. It’s dipping time! Hold a strawberry near its leaves and swirl it around in the chocolate. Pull up and twist to wrap the extra chocolate around. (Yes, your fingers will get chocolaty). Rest the dipped strawberry on the parchment paper. 5. Next, heat the white chocolate as described in Steps 1 and 2. 6. Using a fork, drizzle the melted white chocolate over the dipped strawberries. See, I told you it was easy! The end product looks great; many guests thought the strawberries were store bought. Considering I’ve seen these strawberries selling for $2 each, this is definitely a more economical way to dress up your dessert table. Try it! 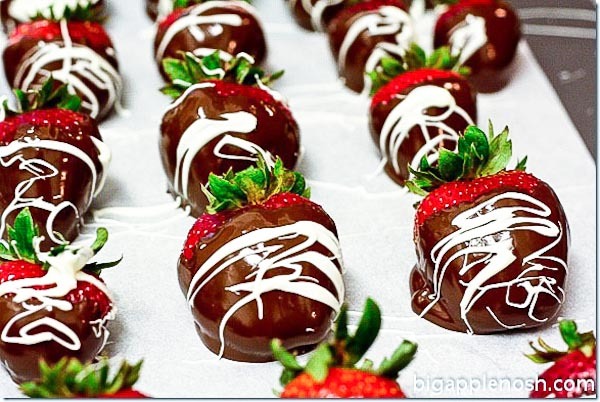 strawberries look so cute all dressed up in chocolate. all the better for chomping on–these look delicious! This has been starred and added to my favorites I LOVE this. Question have you ever tried a strawberry filled with a cream cheese mixed custard? It tastes like a strawberry cheesecake! I love chocolate covered strawberries, and they aren't hard at all. yum! Yum! These look about as easy as the Inside Out Chocolate Covered Strawberries (with Kahlua!) that I make, I might have to try this instead one time! @Nani No I haven't tried that, but I think I'll have to! I continue to be in aw of you. Maybe I will kick my laziness and try this out. love chocolate strawberries! it's to buy them in the store w/o it tasting waxy so it's great you have a good homemade recipe. I’ve learn a few good stuff here. Definitely worth bookmarking for revisiting. I surprise how so much effort you set to make any such wonderful informative web site.